AGILE, VERSATILE, RELIABLE AND EFFICIENT, THIS IS YOUR UPTOWN SOLUTION TO DOWNTOWN DELIVERY. These days, you’re bound to be looking for better ways to squeeze more value out of every business asset — especially your trucks. A tough assignment if you operate in congested urban environments where length and weight restrictions can severely affect payload and profitability. 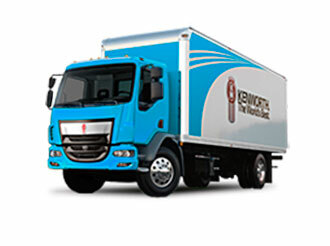 Introducing the all-new Kenworth K370 class 7, one of the most reliable, efficient and productive medium duty trucks ever to hit the boulevards and back alleys of urban North America. Add up the advantages — payload, productivity, reliability and uptime. Then consider one more thing: resale value. History proves that a used Kenworth is a better value to someone else than just about any other medium duty truck you can name. Kenworth K270. Your uptown solution to doing business downtown. Your uptown solution to doing business downtown.